This semester, join us as we take a journey back in time down the Silk Road, immersing ourselves in the rich and varied history and culture that is the story of silk! 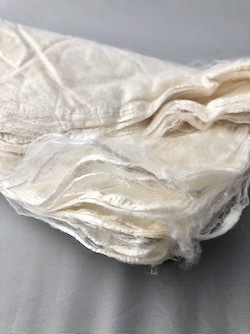 As with all of our other fibers, we will be exploring the qualities of silk in all of its many and and varied forms, starting with the silk worm and its cocoon and heading down each step of the process that gives us silk thread and yarn. The story of Silk is a fascinating one! 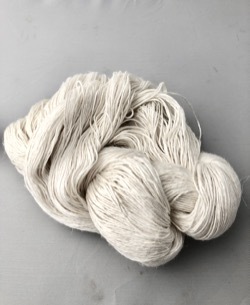 Like previous semesters of the School of Yarn, we have chosen four different yarn and fiber bases: we will begin down the Silk Road exploring silk all on its own; then we will look at it combined with plant and animal fibers. These yarns and fibers will each tell us their own special story of spinning, ply, weight, color, knitting and wearing. With each shipment, you’ll get a PDF full of invaluable information about silk: its qualities as a fiber; how it’s processed from cocoon to reeling and spinning; dyer’s notes about how it takes dye; swatching prompts to help you play with needle sizes and gauges to find each yarn’s ideal range; and project ideas both small and large. We will discuss pattern support for each yarn and have pattern recommendations and discounts from our designer friends for some of those patterns. In the first shipment, your yarn will come with a lovely muslin project bag and a School of Yarn patch so you can carry your learning swatches around with pride! Also included in that first shipment will be a lovely exfoliant to use before working with the Mawatas! I make it myself! Karen and I hope you'll join us as we continue our fiber exploration and education! Mawatas are made from degummed cocoons which are stretched over a frame and then stacked. Each of these 20g bundles consist of so many of these stretched-and-stacked cocoons. It's quite amazing! When each layer is pulled off, separated and then drafted in just the right way you get a fine yet strong length of silk that you can spin into thread — or you can knit it straight from the hankie without spinning! The fabric you get when knitting straight from the mawata is such a soft silky textured piece, it almost looks like it's an heirloom. 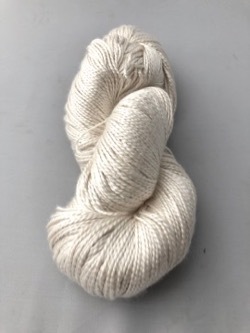 Every knitter at some point in their knitting life should have the chance to work with a 100% silk yarn. Of course, for me this is the one! It is spun at a milll in Switzerland that specializes in spinning silk yarns, so they seriously know what they are doing and they do an amazing job! Luscious is a two-ply DK weight that has just enough twist to assure a well structured and balanced yarn while keeping it loose enough for a lovely drape and softness. I have shawls knit form this Luscious and I so love it! Linen and Silk! Excuse me while I take a moment. I am so excited to have a linen for the summer, and you my friends will be among the first ones ever to knit with it! 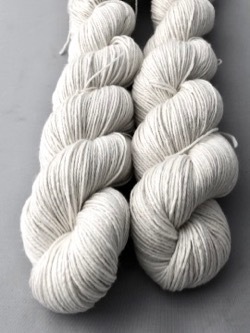 Silk has the capacity to feel cool against the skin as well as insulate, so the combination of linen (a super-strong and drapey bast fiber) with silk should prove to be a fantastic summer-knitting yarn! What could possibly make an ultrafine Merino any better? May we suggest a little Mulberry Silk? (15% to be exact.) La Luna is such a lovely blend of these two fiber superstars, with just enough silk to support the fineness of the Merino and add in tensile strength and durability. I love this blend so much we offer it in three different weights! Of the three, this slightly heavy laceweight is my favorite. La Luna Lace is a 3-ply yarn that is light and lofty, nice and round with just enough elasticity for some seriously lovely stitch definition! Oh and that sheen... Oh my!